The Harry Potter franchise has reached across many platforms, but mobile gaming has not been one of them up until this year’s late April when Jam City, a renowned company dedicated on developing popular mobile games, released Hogwarts Mystery, an allegedly free-to-play mobile app for both Android and Apple. We’d like to stress the “allegedly” bit, as it will probably be the worst trait the game possesses, but let’s first introduce the basics of the game. From the outset, it looks just like the dream come true to any lifelong Harry Potter fan: Promises of in-depth magical experiences are shown all through the game’s advertising, including the all-too familiar endeavors within the magical universe, such as exploring the crevices of Diagon Alley in order to purchase your first wand from Ollivanders, or getting your chance to finally get sorted into one of the four houses. In some way, you actually do come to carry out these activities, albeit not quite as you’d expect. However, the moment you start to play, it’ll show you exactly what you’ve waited for: An owl reaches you with a letter bearing your name, coming from none other than Dumbledore to inform you of your acceptance into Hogwarts School of Witchcraft and Wizardry. From that moment on you’re thrown into the magical world everyone knows and loves, but not without giving in some sort of backstory to your character, which involves your allegedly missing sibling, who’s just been expelled from Hogwarts for certain mysterious cursed vaults hidden in the castle. Your main goal in the game then is to find out about the mysterious vaults and your missing sibling. This shows the developer’s initiative to avoid revised plots involving The Chosen One, but the intent seems like a rather weak attempt at it, for the storyline barely connects to its gameplay, and it ultimately leads to nothing in particular. This fact gets heightened once you consider the time the game takes place into the HP universe: The same year after the murder of Harry’s parents and Lord Voldemort’s apparent death. One might think there was plenty of incredible content the developers might’ve gotten out of that, but the case was sadly far from it. What could’ve been a great RPG mobile game packed with unexplored and original content from the series, actually became a poor effort at trying to intertwine the story with the whole series, creating instead a narrative that pretty much serves the purpose of capitalizing on the existing nostalgia from the fans. You might encounter familiar faces such as Rubeus Hagrid, Bill Weasley, and Nymphadora Tonks, but their appearances although recurrent, won’t add any depth to the story. 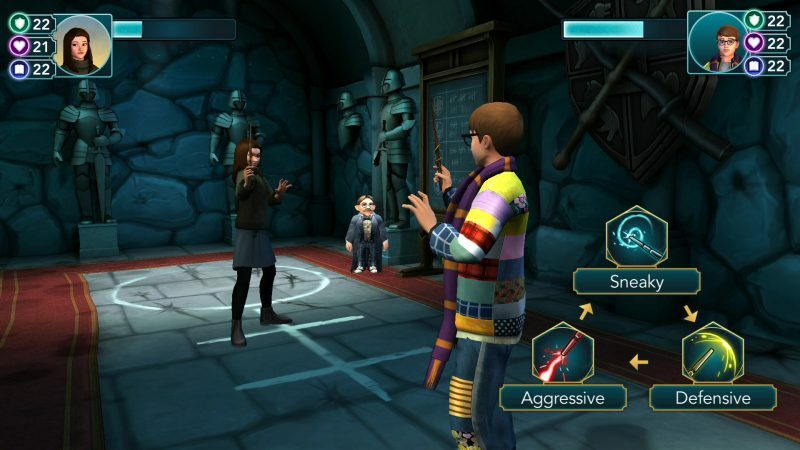 Its gameplay consists of such simple actions, it almost borders on tedious and monotonous: Aside from exploring the castle or talking to students or other characters, you can also duel against classmates or cast spells, but that’s literally just about all you’ll be able to accomplish throughout the whole game. Furthermore, all these activities are done purely by tapping your smartphone, which means there’s rarely a moment where you’ll need to engage with your brain in order to get through each task. Most of the time you’ll proceed by drawing simple patterns on the screen, others by tapping objects with blue outlines, or you’ll occasionally be obliged to play rock-paper-scissors on certain situations, such as student duels. Interactions are pretty menial as well, consisting on choosing between three different responses that will preside the course of the story, though the most adequate answers are so obvious, you’ll hardly stand a chance of shortcomings. Finally, there’s the whole “allegedly” free-to-play business to discuss. Like we’ve said before, all the previously mentioned activities are pretty dull, but they would still be amicable to many casual gamers if it wasn’t for the energy limit set to each player. 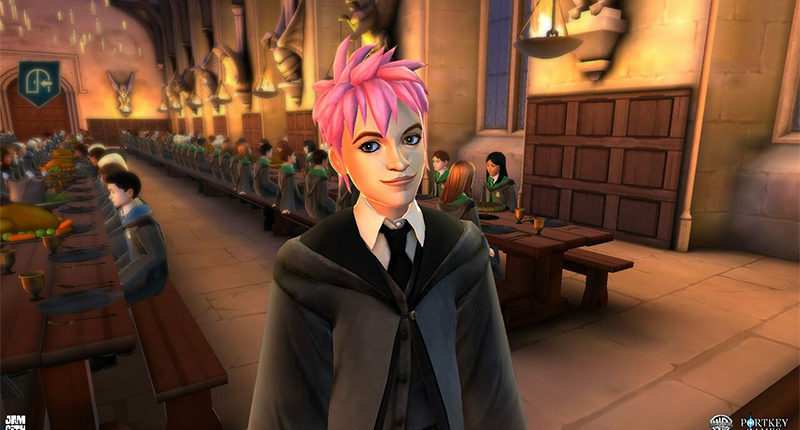 As it happens within many mobile games, Hogwarts Mystery works through in-game resources, which are different types of funds you’ll have in your possession that’ll help you improve your gaming experience. These assets come in the form of gold coins, gems and energy. Gold coins are the most basic income within the game, and also the easiest to acquire, for it’ll only request for you to play in order to get considerable quantities of it, which explains the fact that they’re only used to obtain items of cosmetic use. Gems and Energy however, are quite tough to acquire, and this is where you’ll find out how problematic it can get to play the game without said resources. The previously mentioned Energy is used to perform any task, but you’re only given 24 of them. When you run out of it, it fills up on its own over time, but in a incredibly slow pace. Gems are the solution to the Energy problem, as you’ll be able to purchase Energy with them, but they can only be bought with real money. This isn’t a new concept within the mobile gaming industry, and you might actually be inclined to spend real money on Gems, until you find out how much you’d have to spend so as to actually make the game run as smoothly as you’d want. 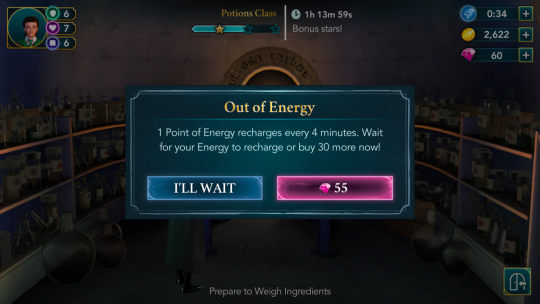 For $4.99 you may be able to get 130 gems, which you can later trade for 90 Energy points, but most typical spells or sidequests will draw out at least 55 energy points, so there’s no need to do the math to find out exactly how much you’ll need to continue playing without waiting so much. Several websites have shown you’ll have to spend an approximate of fifty dollars per hour, and that’s just to refill your Energy points. As we’ve shown all throughout the whole review, there’s little to say about the game that could make us vouch for it. The predatory microtransactions are the worst of the lot within all that’s bad about the game, but its lame writing and subpar gameplay does little to give the high prices to pay justice. 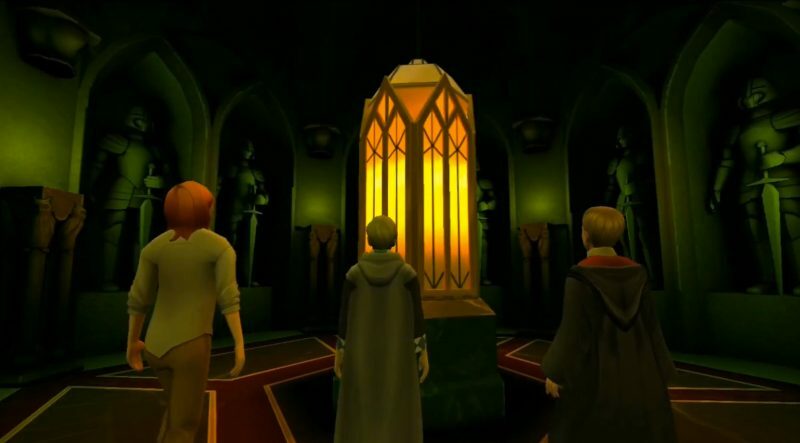 We wouldn’t be so offended by all these faults if it was about any other game, but there are more than enough reasons to believe the Harry Potter franchise deserves a better game to be represented with than whatever Jam City was trying to achieve with Hogwarts Mystery.